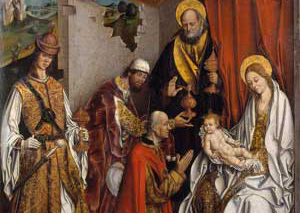 Epiphany marks when the three wise men visited infant Jesus and when St John the Baptist baptized Jesus. This holiday takes place on January 6th each year. This holiday is celebrated by Carnivals and singing. Children dress up as the three wise men, visit houses, and sing about Jesus Christ's birth. Most buildings will remain open however some will be closed. The three wise men visited Jesus Christ, when he was born. They brought him gifts of gold, frankincense, and myrrh.